(VEN) - Cow dung fed earthworms that commonly reach the length of 20cm in more than a month will be used to feed pigs or processed into nutritional foodstuffs. We arrived in Nguyen Thi Lien’s earthworm-fed pig farm located in Tan Phu Village in Soc Son District’s Phu Cuong Commune on a day late last year and were surprised at the cleanliness of the farm. According to Lien, the pigsties were designed to be half opened to the outside so that the pigs can sun-bath and raisers only need to use minimal levels of pesticides. Moreover, the pigs seem to grow fast as they are fed by nearby farmed earthworms. She led us to her 1,000sq.m cow dung-fed earthworm farm and said that earthworms can be used as feed for pigs after more than a month of farming. 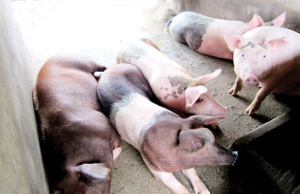 According to Lien, earthworm-fed pigs are highly-resistant to diseases, but do not grow as fast as industrially-fed pigs and only can be marketed after seven months. What is special is that earthworm-fed pork is apparently more tasty and higher in protein content compared with commonly-raised alternatives. The earthworm-fed pig farm model is not widely applied and so those who want to buy earthworm-fed pigs must agree contracts with her in advance. Currently, earthworm-fed pig prices are almost double industrial feed-fed counterparts. Lien was formerly an official in the information technology sector. When she retired, she began to devote herself to developing organic pig farming and subsequently she found earthworms as ideal feed for pigs. She spent days to discover how to successfully farm and researched the benefits of earthworms for people and animals. After more than a decade of implementing earthworm farming and earthworm-fed pig models, Lien has secured a list of organic and safe food and foodstuff providers across Hanoi and largely benefited from considerably higher earthworm-fed pig prices. Despite her earthworm-fed pork being in high demand, she is very cautious about the quality of the pork and has paid due attention to quality management with a view to increasingly gaining consumer trust. “I intend to outsource the earthworm-fed pig models to several neighboring farmers and will closely monitor these satellite farms,” Lien said. According to Nguyen Thi Lien, earthworms are high in protein and can be used as a nutritious foodstuff and a medicine.